We are happy to announce that www.tripbarker.com is now on Open Alpha. This means that we are now ready to accept users to test the main features of Trip Barker. However, as the site is still under heavy development, please expect some bugs and issues which we hope you’ll let us know of by posting it in http://community.tripbarker.com or by emailing us at info@tripbarker.com. Traffic Reports – Once you have a transit route plotted, Trip Barker will provide you real-time traffic reports to let you know of how much traffic there is along your planned route. Moderate to Heavy traffic areas will automatically appear on the map, while clicking the “Incidents” and “Traffic” tabs will list down a summary of traffic-related events along your route. Trip Barker For Mobile – Registering with Trip Barker and visiting the site via your mobile phone will unlock even more features for you to use. 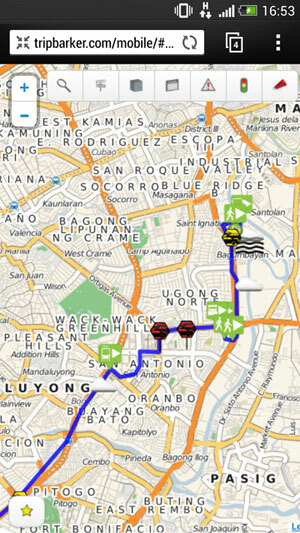 The trip planner now defaults to your current location as detected via GSM/Wifi Triangulation or via GPS. Trip Barker for Android – Get even more features such as Trip Logging by downloading our upcoming Android App. Trip Barker API – Create your own apps using Trip Barker data by accessing our API. Tagged commuting philippines, gtfs feed philipines, gtfs philippines, transit app philppines, transit philippines, transit tool philippines, trip app philippines, trip planner philippines, trip planning philippines. Bookmark the permalink.